micro BLDC motor surgery system is a new product newly successfully developed in our company. It is essentially supported by the Ministry of Science and Technology of PRC and it also can compatible with international surgery system. micro BLDC motor surgery system developed in our company adopts the brushless permanent magnetism dc motor as power developed in our company. Such motor is without carbon brush and no abrasion problem. Therefore, the high revolution can be designed. In principle, it is based on the permissible maximum speed of revolution for bearing. Owing to no carbon brush, the moment can be increment. BLDC motor developed in our company adopts new technology and new material. Therefore, the motor can be disinfected in high pressure high temperature pot. Its cable also adopts high temperature cable, the cable and motor can be disinfected in high temperature and the cross infection problem is thoroughly solved. micro BLDC motor surgery system is a set of medical micro power system. It can offer 1,000~30,000rpm of revolution and greater than 40W output power. The motor adopts the international prevailing type E standard interface. It can be used in coordination with domestic & overseas productive any type E standard interface hand piece for different surgery. When fitting on the hand piece with different speed ratio, the revolution can be changed in the range of 1~150,000rpm and the maximum moment can be 60Ncm. For enhancing the surgery effect, the surgery system has set up two motors A & B. In doing so, the trouble to repeatedly change the nose disappears, enhance surgical effect and shorten surgical time. To be convenient for operation, the controller has two sets of identically power keys. One is set up in the front panel while the other is set up on the top cover. No matter whether press the key in front panel or press the key on top cover can play the same role. The surgery system is also equipped with one cooling water peristaltic pump and the maximum water output of the pump is 150ml/min. 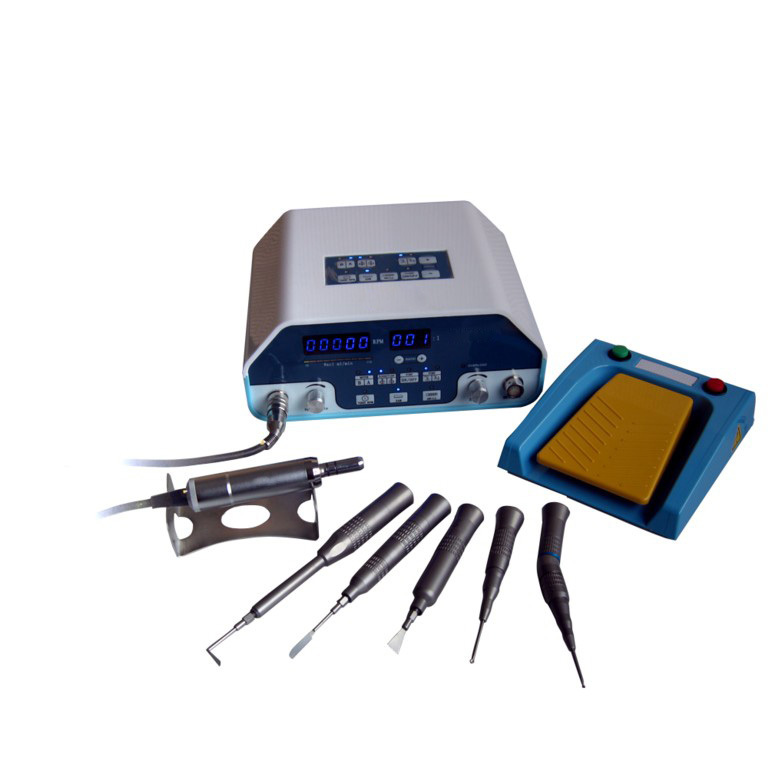 It is suitable for micro surgery in oral and maxillofacial surgery, etc. needing drilling, grinding and sawing.